Not so happy feet? – Forest & Bird Not so happy feet? A comment my colleague and I often get as New Zealand photographers is ‘you must have had a wonderful time in Antarctica’. As much as I’d love to say ‘yes, it was awesome, but a bit chilly’, the truth is we’ve never set foot south of Dunedin and people are usually looking at our pictures of Fiordland Crested or Yellow-eyed Penguins. Now I love ‘Happy Feet’ and ‘March of the Penguins’ with their iceberg-strewn backdrops as much as the next person, but it’s surprising how few people realize that we have some of the most amazing – and rarest penguins on the planet are right on our doorstep. Christchurch Mayor Bob Parker said recently of a new tourism drive ‘I doubt tourists will want to come to the South Island just to see a penguin’ – but why not? From recollection they were fairly thin on the ground north of the equator last time I was there, and with a million birdwatchers in the UK alone, I’m sure there’s plenty of people who’d willingly put up with the West Coast’s finest sandflies for a glimpse of a Fiordland Crested Penguin in his dapper dinner jacket. Indeed, if current research is to be believed we should be making the most of these opportunities while we still have them, with the Eastern Rockhopper Penguin of Campbell Island declining by a staggering 94% percent since the 1940s. Our mainland penguins are not faring much better, with factors such as habitat loss, introduced pests and un-managed human disturbance – especially dogs, all affecting yellow-eyed, Fiordland and little blue penguin populations. Although typically shy species, a number of conservation groups and committed individuals are giving people the chance to see these iconic birds, whilst allowing the penguins to get on with life’s other challenges like avoiding sea-lions and rock climbing. We can certainly help by not disturbing the penguins as they go about their daily lives, but bigger factors such as climate change and the potential effects on sea-surface temperature and therefore the availability of prey, is something we all have to consider as it begins to affect seabirds across the world from New Zealand to tiny Scottish Islands. So next time a friend is showing you the brochure for the latest luxury Antarctic expedition, why not suggest a few days visiting New Zealand’s own cast of ‘Happy Feet’, and take the chance to see these superb birds in our own backyard – and without the extra thermals. Tom Marshall has contributed 5 entries to our website, so far. View entries by Tom Marshall. Nice pictures! 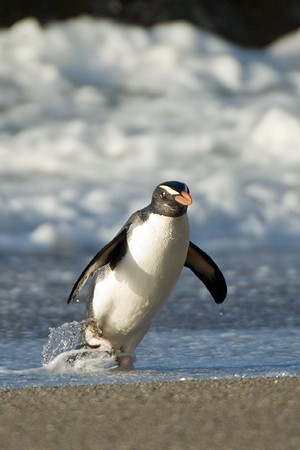 There’s something quite adorable about penguins, I think it’s the way they waddle along like toddlers. Your photos captured this perfectly. This area is right up at the top of my list! It is one small way that ordinary people can help save penguins. 1. DOC has to be prepared to be tough. Set clear laws in place, enforce them and be prepared to go to prosecution to uphold them. There is a general gutless attitude prevailing in DOC these days that ‘enforcement is unpopular” therefore they don’t like to do it and fall back on the gutless approach of saying they will put their efforts into education only. It isn’t enough because you talk to lots of the fishermen and people who take their dogs into these colonies and they’ll tell you “My dog wouldn’t harm a flea”…don’t believe it. It only takes a few minutes and lots of penguins will be dead. 2. Why on earth havn’t we got coastal communities throughout NZ who care for their penguins–these are mostly blue penguins–campaigning for more coastal wildlife refuges that prohibit dogs. It is one straighforward and commonsense way we can help the penguins. Every time I see reports of another group of penguins being killed by dogs I despair. DOC could take the lead and show communities how to get Wildlife Refuges. Maybe Forest and Bird should do it? If only people could understand what an industry bird watching is overseas. I guide for a nature tour company and each year lead a group of bird watchers around our wonderful country. These people come to NZ to see your native and endemic birds. Penguins are always close to the top of their lists ! Look what the Penguins have done for Oamaru, that is great success story. 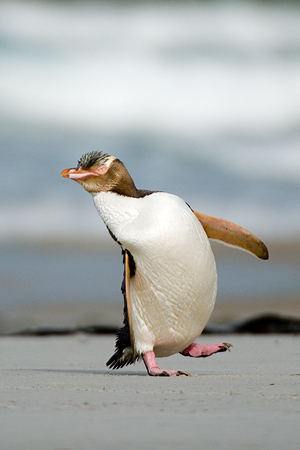 I always love penguin, the way it walks, the photo was really wonderful , i can see a young penguin it is really cute.